sculpture, the two sides connected by a 12 metre bridge. With steel art deco railings and carved columns, the bridge has its own cascading greenery to mimic the glorious tumbling rapids on one side, and on the other, where the river spreads out into a lazy crawl, a delta of sunlight and green, framed by towering four-story bamboos, feathery palms, luminescent mosses and ferns. Everywhere there are dazzling views to write home about, with the post-colonial chic of Gatsby era glass awnings over doorways, Juliette balconies and gorgeous wrought iron fencing looking out from multiple vistas, onto the jungle-lined river. This all-mod-cons yet traditional estate appears like it has been here for centuries yet has been totally refurbished over the last three years to meticulous Western standards. culture, ‘Saratoga’ is widely regarded as the most beautiful and readily accessible jungle retreat of all. This unique oasis of nature, ideally located a mere 18 minutes from bustling Canggu, the new epicentre of Bali tourism, includes 1,500sqm of vacant land and zoning for a total of 25 rooms on site. 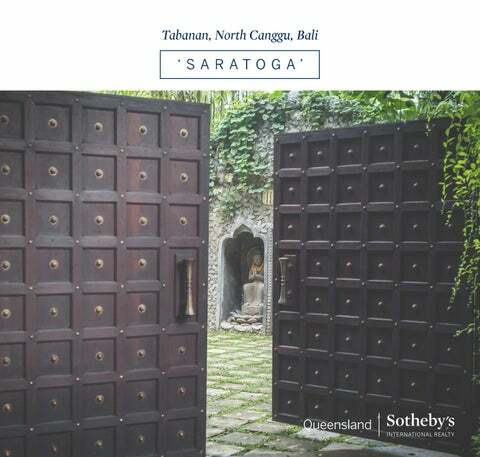 With additional freehold land adjoining if required, ‘Saratoga’ is ripe for development as a world-class retreat, wellness centre or boutique hotel. ‘Saratoga’ is named after a tropical river fish much coveted by Asian cultures as a living good luck charm. Indeed, whoever secures this showcase property, whether as the ultimate lifestyle escape or iconic commercial landmark, will be blessed by the good fortune of knowing there will never be another one like it anywhere in the world. (western) side. Plus 785sqm (7.85 are) approx. leasehold, comprising 550sqm (5.5are) of adjoining land to protect the river view, 100sqm (1 are) ceremony river platform (which can be coverted to freehold). Parking area: 135sqm (1.35 are) Please note all measurements are approximate ++ Access via Kaba Kaba although alternate access from the Cepaka side has been verbally agreed to subject to the purchase of additional land. Currently on Site Note: Saratoga has been remodelled as a wedding venue as reflected by some of the rooms which have been repurposed to suit, eg styling room and children’s area. These could easily be converted back to bedrooms. *US dollars conversion is based on exchange rate as at 5th April 2019. The information set forth in this brocure is based upon information which we consider reliable, however because it has been supplied by third parties we cannot represent that it is accurate or complete, and it should not be relied upon as such. The offerings are subject to errors, omissions, changes, including price, or withdrawal without notice. 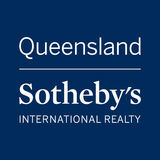 All dimensions are approximate and have not been verified by the selling party and cannot be verified by Queensland Sothebyâ&#x20AC;&#x2122;s International Realty. It is recommended that you hire a professional in the business of determining dimensions, such as an appraiser, architect or civil engineer, to determine such information.